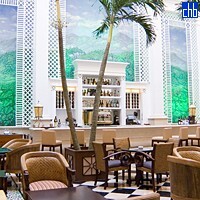 Up till recently, discerning visitors have bemoaned the lack of a really luxurious hotel in Havana. 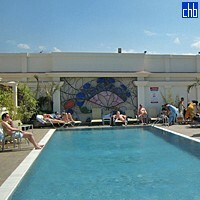 The Saratoga, which opened in November 2005, has rectified the situation. Standing on the western edge of the Historical Centre of the city, its elegant façade overlooks the other nineteenth century architectural glories of the Prado and Parque Central. 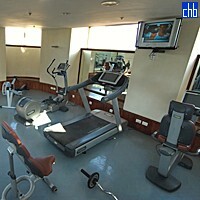 The interiors, designed by European consultants, are simple, spacious, elegant and exceedingly comfortable. 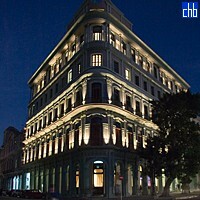 We particularly recommend the seventh floor ‘Saratoga’ rooms overlooking the street, which have inviting window seats upon which one is terribly tempted to recline for hour upon relaxing hour, reading or watching Havana’s street life from the air conditioned quiet in the hotel – mercifully the designers thought to double glaze the windows, so the usual Havana cacophony does not prevail. 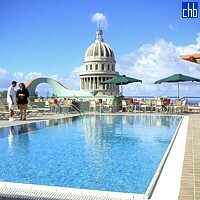 The pool, gym and bar on the roof are also oases of calm and have wonderful views over the city and the sentinel angels on the roof of the Gran Teatro de La Habana. 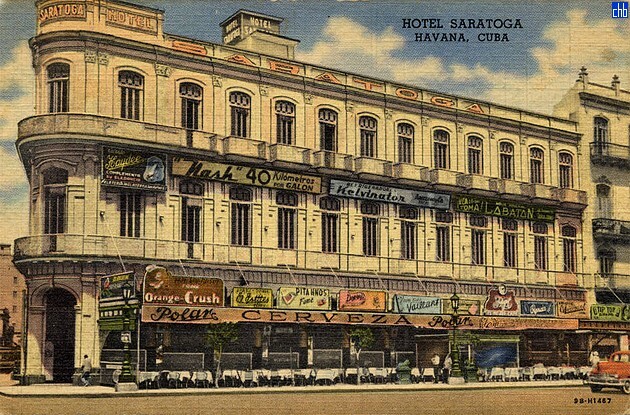 All the rooms have up-to-the-minute technology, the mudéjar-style restaurant is very attractive and the central courtyard has been glazed over and air conditioned so that neither extremes of heat nor Cuba’s occasional torrential downpours need interrupt guests’ enjoyment of their mojitos. 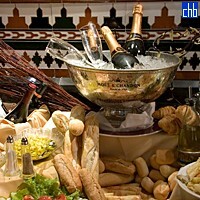 Excellently located for evenings at the opera and ballet, drinks and dinner at the Floridita and exploration of Old Havana, the Saratoga definitely has the Cubaism seal of approval and might win our Hotel of the Year Award if its service continues to develop along its present excellent lines. 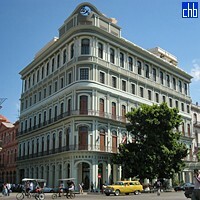 It is run by the Office of the City Historian of Havana, so much of its profits are reinvested in the restoration of the city’s historical centre. ‘Saratoga Modern’ rooms, on the first and second floors, have brightly coloured upholstery and attic-type windows with long window seats beside them – these are our favourite standard rooms at the hotel. ‘Saratoga Colonial’ rooms have mosaic floors, carved wooden beds, large French windows and some have attractive iron balconies. All Saratoga Rooms have either king-size or twin beds. Saratoga Rooms on floors 5 and 6 are for smokers; all the others are non-smoking. All Saratoga rooms have a good view of the Parque de la Fraternidad and Dragones Street and from many of them one can also see the Capitolio Nacional. Ten of them connect with other rooms in the hotel through a double internal door. 40 rooms distributed over 7 floors. The decorative style is dictated by the floor the room is on; either modern (informal) or colonial (having a certain formality). The modern style rooms are on the first and second floors; they have cream-coloured marble floors and brightly coloured upholstery. The rest of the Patio Rooms are decorated in colonial style with mosaic floors and carved wooden beds. 31 of the rooms have king-size beds (203cm x 195cm), 7 have queen-size beds (203cm x 151cm, room numbers 103, 203, 303, 403, 503, 603 and 703) and 2 - room numbers 102 and 202 – have twin beds (202cm x 134cm) - these two rooms are designed for disabled access. All Patio rooms face inwards into the building’s courtyard. Those on floors 5 and 6 are for smokers; all the others are non-smoking. 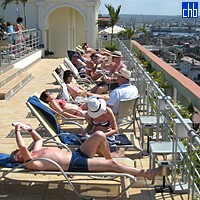 The two Havana Suites are located on the first and third floors of the hotel and measure 100 square metres. 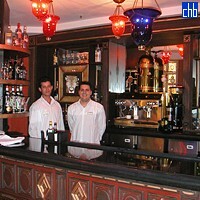 They are decorated in colonial style but also have a number of modern decorative elements. Maximum occupation is 2 adults and 2 children: 2 extra single beds may be placed in the sitting room upon request. 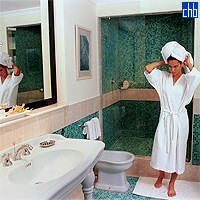 There are no Havana Suites for smokers. 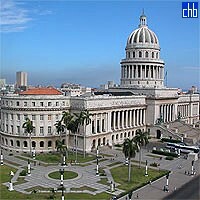 Both Havana Suites have king-size beds and overlook Dragones Street, the Capitolio Nacional and Parque de la Fraternidad. 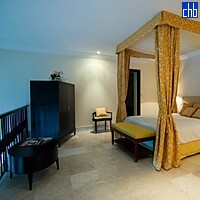 They have high ceilings, a sitting room with adjoining guest bathroom and a bedroom with adjoining principal bathroom. The sitting room has a running balcony with four soundproof doors and the bedroom has a separate running balcony with 3 soundproof doors. The two Capitolio Suites are located on the fifth and sixth floors of the hotel and measure 60 square metres; both are decorated in colonial style. Maximum occupation is 3 adults or 2 adults and 2 children. They have inviting sofa-beds (177cm x 135cm) located in their sitting rooms upon which 1 adult and 2 children may sleep very comfortably. These suites may be used by smokers, both have king-size beds and both (Rooms 512 and 612) overlook the Capitolio Nacional and Parque de la Fraternidad. 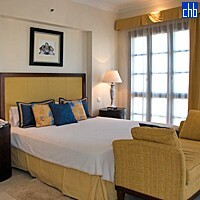 They have high ceilings, marble floors, a sitting room, a guest bathroom and a bedroom with adjoining principal bathroom. Both the sitting rooms and the bedrooms have tall French windows and the principal bathrooms have attractive baths with lion’s-paw feet. All three Prado Suites are located on the third floor and measure 75 square metres. They are decorated in colonial style and may be occupied by 2 adults and 3 children or 3 adults and 1 child. There are no Prado Suites for smokers. Prado Suite Number 315 overlooks Dragones Street and the Capitolio Nacional, Prado Suite Numbers 305 and 307 overlook the Capitolio Nacional and Parque de la Fraternidad. Prado Suites are duplex rooms with an internal staircase to an upper floor which contains the main sleeping accommodation, and a principal bathroom. Prado Suites have marble floors and high ceilings and their sitting rooms have balconies and a small adjoining guest bathroom.